beginner here I am trying to analyse a large set of points (2 millions) over a set of polygons (3000), and particularly find clusters of points. Doing it in QGIS was taking too long/crashing the compputer so I uploaded my layers on a Spatialite DB and use the interface provided by QGIS. I have managed to do what I want using a few scripts in a row, but the cluster analysis is based on measuring the area of the dissolved cluster of buffered points, which doesn't take into account density. I have tried to add "weight" to the points and do a count but I can't get the query to work because the query results in a multi-part polygon. Any idea to simplify or improve this process to a lower number of steps? Then I split the resulting polygon into multipart into singlepart, and calculate area. What I would like is to use something else than ST_unaryunion that allow to retain the number of points per clusters.. Response that might help others in the future.. The easiest and fastest way I found was to switch to PostGIS which has been orders of magnitudes faster and way easier to handle. It didn't end up being all that hard. If you're on a Windows machine, just install PostgreSQL with the PostGIS extension. You'll operate it via PGAdmin. To import geo files to your PostGIS databases you will need the PostGIS importer/exporter which is basically just a window that helps you connect to your Postgres database and upload file to it. There's good youtube videos walking you through the install.Depending what you do it might involves going back in forth between QGIS and PGAdmin. Adding PostGIS layer in QGIS is easy, click on the Elephant icon below the vector and raster "add layer" icon. Then I basically ran two queries back to back, (running in seconds instead of hours!). 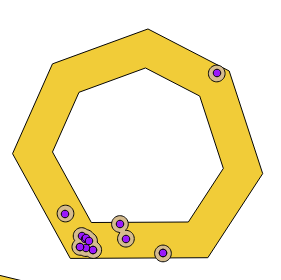 The first one buffers each points and dissolve to create clusters. And that does it. I end up with a new layer that has areas with a density column that I can import into QGIS and browse through area of interests. Browse other questions tagged qgis spatialite clustering count singlepart or ask your own question. How to cluster points based on a kernel density? How can I cluster all points in a postgis table together based on their distance from each other? How to create dissolved buffers using QGIS virtual layers? Finding number of Points within Cluster by different sizes using QGIS? Perform cluster with point limit?